Expand the intervention if pilot test is effective. Jennifer’s webinar presentation included case studies of scalable programs that have successfully used community-based social marketing to increase energy-efficiency and other conservation behaviors. In a program Action Research implemented for the Urban Sustainability Directors Network (USDN), the desired outcome was to increase energy efficiency in municipal facilities and the goal was to increase employee engagement in a specific energy saving action.Action Research staff worked with USDN members (municipal sustainability directors) to prioritize a range of energy reduction behaviors and select the one with the highest potential energy savings impact and probability of participant success and lowest penetration (number of people already engaged in the energy reduction behavior). Municipal employee computer/monitor shutdown was selected as the “target” behavior based on these criteria. Action Research staff gathered focus group and web survey data from municipal employees from one city and two counties about their computer/monitor behavior. One third of employees reported not shutting down their computers at the end of the workday in two municipalities. (In the third, 90% turned off computers due to an existing policy.) 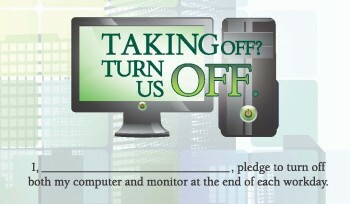 One third of employees in each of the three municipalities did not turn off monitors at workday’s end. Management subsequently emailed a policy requiring all employees with individual workstation computers to shutdown both computers and monitors at the end of every workday. A randomly selected subset of employees received an additional CBSM “behavior intervention.” They were personally visited by an intern or other municipal staff person who verbally reiterated the computer/monitor shutdown policy and gave them a flyer outlining the cost and energy-saving impacts of this policy. They were also given a commitment card pledging to uphold the policy that they signed and displayed beside their monitor as a reminder. Post-intervention evaluation showed that daily computer/monitor shutdown increased by more than 20% amongst employees who had received the “behavior intervention” compared to those who received policy information only. The program was particularly effective for monitor shutdown which more than doubled as part of the campaign. You can view Jennifer’s webinar slide show presentation at: https://www4.eere.energy.gov/seeaction/events .